Gentle verse and sweeping, majestic artwork set imaginations soaring in a handsome and illuminating ode to the ancient art of falconry. 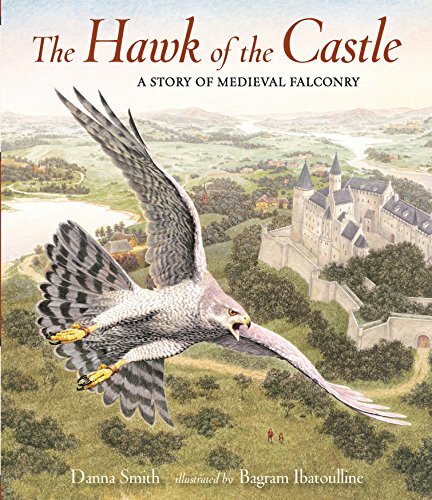 Join a young girl and her father, the falconer at a medieval castle, as they experience the joys of taking a goshawk out for a training flight. The girl leads readers through all the preparations and equipment needed for the flight — from the hawk’s hood and bells to the falconer’s gloves — culminating in a dramatic demonstration of the hawk’s hunting skill. Bagram Ibatoulline’s masterful illustrations capture the vivid details and beauty of a day spent hawking, while Danna Smith’s poetic storytelling will make readers long to experience the art and sport of falconry firsthand.